Reflections of a beautiful afternoon on Swan River. Swan River is an awesome Montana river for kayaking, canoeing, fishing and of course the mid-summer float trip. 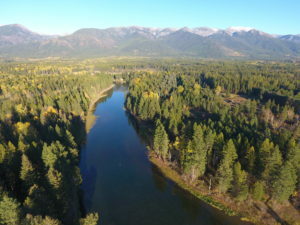 Swan River flows through the Swan Valley and Condon, MT, then feeds into Swan Lake and then continues meandering through rural Bigfork, ending in Bigfork Bay and Flathead Lake. The last stretch of the Swan River before spilling into the lake is known as the “Wild Mile” and is celebrated every May with the Whitewater Festival kayak competition (Scroll to bottom to see video of the competition!). Popular with both locals and visitors, the popular “Wild Mile Trail” (or Swan River Trail) is a two-mile path along the banks of the Swan River starting a few blocks off the main street of Bigfork. The real estate along Swan River varies widely from upscale homes, seasonal cabins to vacant property. Because it is such a long river, there is generally a good selection of homes or property for sale at any one time.